What was the real purpose of LPAG? Leadbeater’s Possum was assumed to be extinct until it was rediscovered near Marysville in 1961. Ten years later, it was adopted as the state’s faunal emblem. Its preferred habitat is the Ash forests of the Great Dividing Range, the same forests favoured by the logging industry.A reserve system was established in 2008, but 45% of it was burned in the 2009 Black Saturday bushfires. Last year the Arthur Rylah Research Institute published a study concluding the system is inadequate. The Victorian Government set up a Leadbeater’s Possum Advisory Group (LPAG), to develop recommendations. It reported to the environment minister in January 2014 and he announced government support for its recommendations in April. Let me not mince my words. LPAG’s recommendations, as accepted by the Victorian Government, are, in Prime Ministerial terms, ‘crap’. It’s not that the work of the group was worthless. It gathered information, considered a range of proposals and generated powerful conclusions. 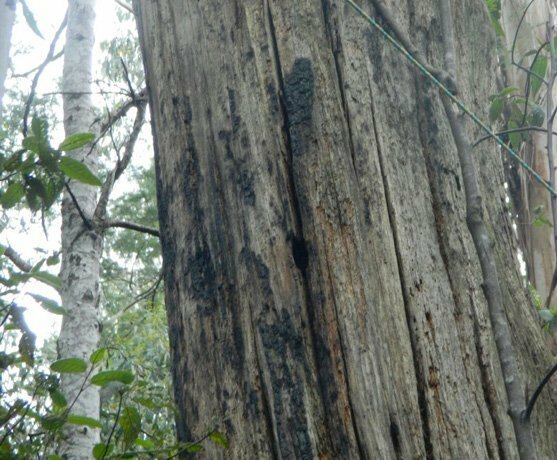 However, a mediocre outcome was made inevitable by the government’s Terms of Reference, imposed to ensure a result consistent with its declared policy of allowing continued logging of Leadbeater’s shrinking habitat. Of the many individual proposals assessed by the group, a Great Forest National Park finished a ‘country mile’ ahead of all the others, improving the species’ prospects by a full 10%. Most of the short-listed actions scored 1% or less and the runner-up only 4%. When ‘packages’ were compiled and compared, new prescriptions developed by the Australian National University, including a new park, increased the probability of a ‘good’ outcome by a score of 19. In contrast, the accepted recommendations scored a paltry 7! 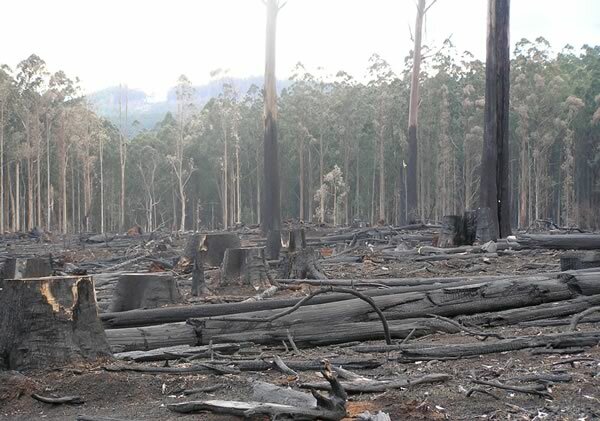 The state government’s Terms of Reference (ToR) demanded that recommendations be “focused on supporting the recovery of the Leadbeater’s Possum while maintaining a sustainable timber industry”. Packages of proposals fell into two groups: those that would do little either to support the possum or to threaten the industry, and those, like the new park and ANU prescriptions, that had a real chance of effectively addressing the possum’s extinction risk by significantly reducing the scale and intensity of logging in its habitat. Because they challenged the industry, the latter had to be rejected as ‘not within the ToR’. In this way, the government (and industry group members, the Victorian Association of Forest Industries and VicForests) ensured that only recommendations consistent with supporting logging could survive analysis. So what are the thirteen recommendations and what makes them mediocre? Friends of Leadbeater’s Possum has reviewed and assessed them. To establish a 12 hectare buffer around colonies. Edge effects of nearby logging (wind exposure, escaped burns, smoke) mean that, in practice this will protect only 3ha, the area needed to support a single colony. In the unlikely event that animals surviving within these tiny pockets breed, the young will have nowhere to go. They will be isolated from surrounding forest for generations. To delay harvesting for two years in areas where modelling has shown a 0.65 probability that possums may be present. Serious questions exist as to whether the modelling is accurate but, that aside, 83% of those areas are already within parks or reserves, so few, if any, animals (only those in the remaining 17%) would benefit. To use ‘Retention Harvesting’ in 50% of logging coupes. Variable Retention is used in Tasmania and experiments have been conducted in Victoria since 2003. If it is properly applied it could lead to more complex and varied habitat developing in coming decades. To be credible, a retention option must be accompanied by reduced production. The recommendations do not reflect this. Indeed it appears that during discussions the industry set a cap of 5% on the total yield reductions it would accept. So it must be concluded that this version of ‘Retention’ would be little more than a re-badging of traditional logging practice, with some retained islands of forest surrounded by clearfelling. To establish buffers to protect ‘old growth’. 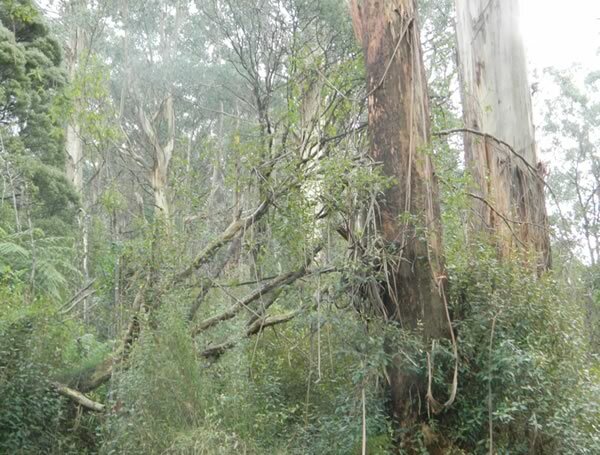 DEPI figures show that less than 1.2% of Mountain Ash forest in the Central Highlands is unlogged and unburned since 1939. This tiny area is mostly already protected, so adding buffers will make little or no difference to the possum. To amend the Leadbeater’s Possum habitat zone (known as 1A). The change proposed, reducing the requirement for 12 live, mature or senescent Ash (potential nest) trees per 3 hectares to 10, is minimal (the ANU prescriptions require 8). Importantly, it excludes improved protection for dead trees, the preferred nest sites. These, vulnerable to decay and fire, are increasingly few and far between and not being replaced. 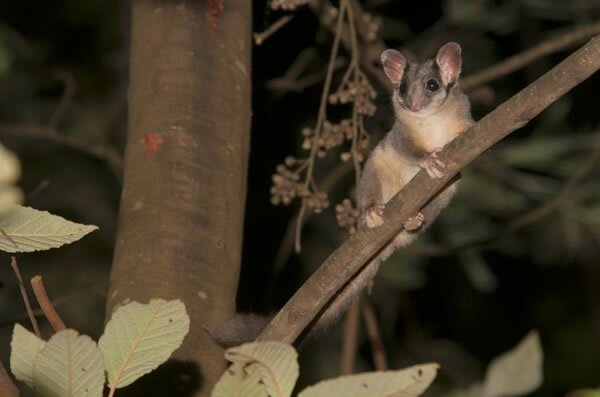 To ensure that 30% of the Ash forest in each ‘Management Unit’ of the possum’s range is protected so that it is able to reach its ‘oldest growth stage’. Like other proposals in this category it sounds good but the devil is in the detail. Only two of the 21 units do not already have 30% of their Ash forest protected, so little will change. And in those two, logging is currently continuing. Forest that ought to be protected could be destroyed before it can be assessed. If the government were serious, it would declare an immediate moratorium until this re-assessment has been conducted. So much for the ‘good’ recommendations in LPAG’s package. From here on it’s all downhill. A couple can be reasonably characterised as ‘investigations’, with unknown and possibly negative results taking decades and coming too late, given the species is on a rapid trajectory to extinction. These include trials of alternative post-logging regeneration practices, nest-boxes, and methods of artificially damaging trees to encourage accelerated development of nest hollows. Translocation is also to be considered – a high-risk strategy indeed, even if there were suitable (yet vacant) protected habitat available to translocate animals to. All remaining proposals deal with incidental issues such as fire management, community engagement, and monitoring and review. These are, or should be, already occurring to some extent. They mean well but are unlikely to produce any tangible benefits to support the possum’s survival. Critically, several important proposals didn’t make the cut and have been omitted. The government’s own research (conducted by DEPI’s Arthur Rylah Institute), and that of the ANU, found that the current Reserve System is inadequate to provide for the species’ long-term survival. Yet the recommendations contain no proposal for a significant increase in the reserve, No proposal has even been included to compensate for the 45% of the reserve that was lost in the 2009 Black Saturday bushfires. Nor is there any recommendation to protect the critically important individual hollow-bearing trees that have become so rare. 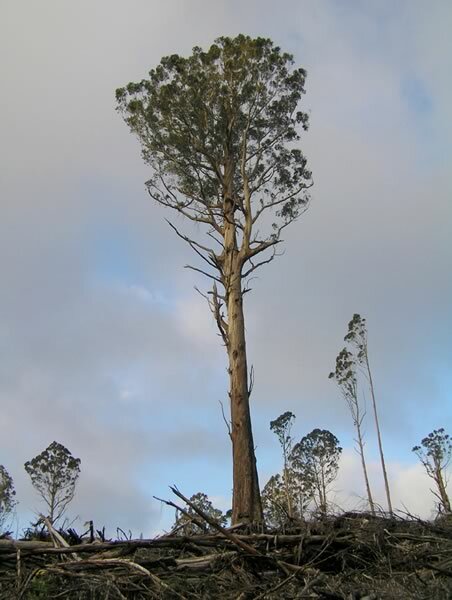 Trees germinated before 1900 are not supposed to be harvested, but any retained are frequently destroyed or damaged during logging or post-logging fires. Any that remain are exposed and often lost soon after the loggers have left. They must be protected from logging and its after-effects within adequate buffers. There is no recommendation to increase the width of streamside buffers, as called for in the ANU prescriptions. Currently these are too narrow to provide habitat for Leadbeater’s, though they are often in sheltered gullies that contain old hollow-bearing trees. This is an important omission of a significant proposal. In stark contrast to the Advisory Group’s derisory suite of recommendations, there is the proposal for a new Great Forest National Park. This was clearly identified by LPAG as the option ‘considered most likely to have the greatest benefit to the species’. LPAG’s model “suggests that the Lindenmayer et al. prescriptions option [which includes establishment of a Great Forest NP], offers the best chance of recovery for the species”. It was also the ‘strongest call’ from the public, appearing in 70% of written submissions. It was a proposal so likely to be effective it had to be excluded by the Terms of Reference. The government’s instructions to the group also precluded consideration of the many co-benefits of the Park proposal. The Arthur Rylah Institute study listed another eighteen threatened species of vertebrates in the region. All would benefit within a new park. As would innumerable species that are not currently threatened, invertebrates and plants, including the Mountain Ash itself, the tallest flowering plant on Earth. 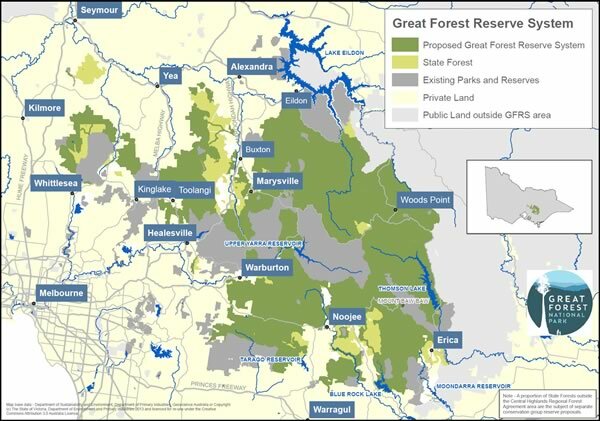 The forested water catchments that supply the headwaters of the Yarra to the south of the Great Divide and the Goulburn-Broken River system to the north would be preserved. The storage potential of the world’s most Carbon-dense forests could become a valuable asset. And many new jobs would be created in restoration forestry and ecological tourism. The gulf between effective proposals to conserve the state’s animal emblem and those accepted by the logging industry is clear evidence that we can no longer pretend that the recovery of Leadbeater’s from the brink of extinction is compatible with the continued destruction of its habitat by industrial logging. The time has come to choose. It appears the government has made its choice. Maybe it’s time to choose a new government. Postscript: In November 2014 Victoria did indeed chose a new Government led by Dan Andrews MP. Lisa Neville, Minister for Environment, Climate Change and Water, has announced an intention to establish a taskforce but terms of reference have not yet been announced (February 2015). We continue to monitor developments. Steve Meacher is the Friends’ representative on the official Recovery Team. He lives on the edge of Toolangi State Forest. This is an expanded version of an article that was published in Park Watch in June 2014.